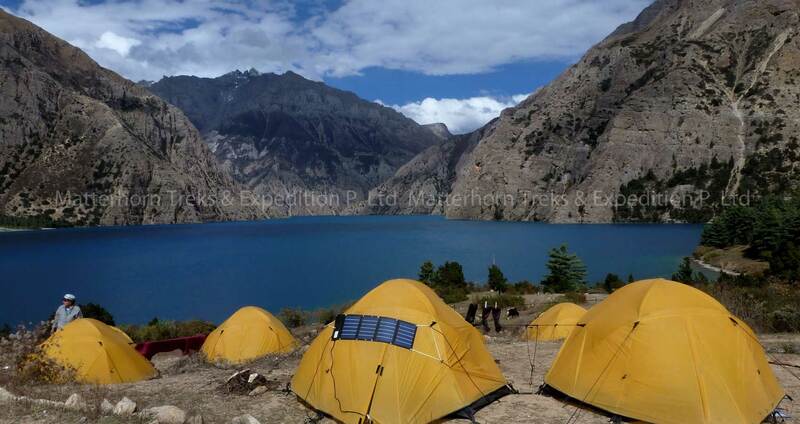 This trek starts from Dolpa and ends at Jomsom. Dolpo is the biggest district among. It is famous in the world with the movie “Caravan” whose shooting has taken in this place. Dolpo is a very big place to see the landscape. The Shey-Phoksundo National Park also lies in this region. While proceeding along the trek you can see a no of mountains and a number of vegetation all along. Dolpo Mustang route is very new and very good route to trek in which have lots of capacity to get flourish. To get to Dolpa, generally you have to fly to Nepalgunj first. Nepalgunj is a steaming hot city in South Western Nepal, in the lowlands of Terai, close to the Indian border, which is just 8 km away. Culturally the areas more resemble India than upland Nepal. Take a cycle rickshaw for a ride in town. You pass the hustle and bustle of the bazaar and see horse carts full of colorful people going to or coming from the Indian border. The Bageshowri temple is one of Nepal’s most important Hindu temples and is worth a visit as well. It’s just a 35 minutes flight to Juphal over steep mountain ridges with beautiful views of snowcapped mountains. Juphal airport is just a gravel airstrip amidst the mountains, which guarantees a spectacular landing. Stepping out of the plane, you enter in a completely different world. From a hot city in the plains, you arrive in a small mountain village, situated in the midst of the Himalaya, breathing in crispy cold air. Camp or guest house overnight.